George Osborne may not have done company drivers any favours, but he gave a shot in the arm to Mitsubishi. 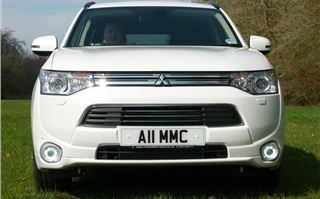 The timing of the UK launch of the Outlander PHEV could not have been better. Because while company driver BIK tax for something like a Lexus CT200h virtually doubled, BIK on the Outlander is just 5% of £28,249, so a 40% taxpayer will pay a mere £665 over the next year for having one on the company. A ‘plug-in’ series hybrid such as the Vauxhall Ampera, Chevrolet Volt and BMW i3 in which electrical energy is transferred from the mains by cable to a battery that powers an electric motor that turns the wheels, with back-up provided by an engine that turns a generator to put energy into the battery. And a parallel hybrid such as a Toyota Prius, Toyota Yaris hybrid, Honda CR-Z or Honda Jazz hybrid where the engine drives the car but where regeneration captures energy to drive an electric motor either to turn the wheels of the car or to assist the engine. 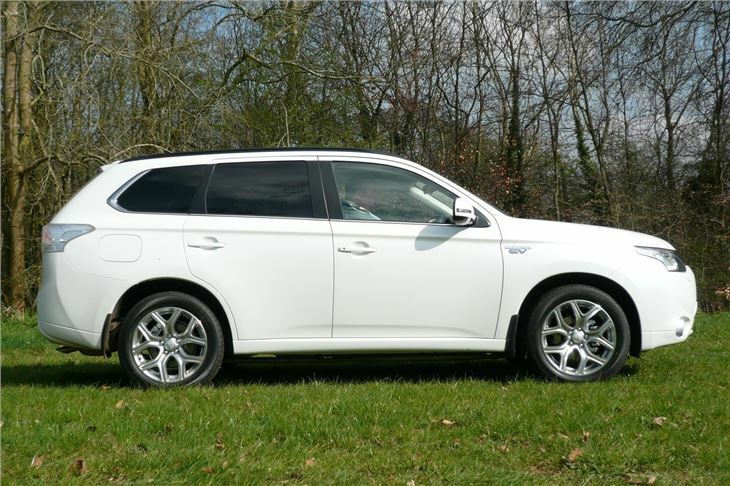 What’s different about the Mitsubishi Outlander PHEV is that it combines the technology of both a series and a parallel hybrid. So instead of the short electric range of a parallel hybrid it can go up to 32 miles on stored electricity alone, just like a series hybrid, using no fossil fuel (except that burned in the electricity power station). And qualifies for the government £5,000 EV grant. On the ECDC it achieves 148mpg combined. Driving on its petrol engine alone it manages 48mpg combined. ECDC CO2 is a mere 44g/km. And an employer buying the car for an employee can write down the entire cost against first year’s profits as well as paying National Insurance Premiums on £1,412.45 for the GX3 base model. 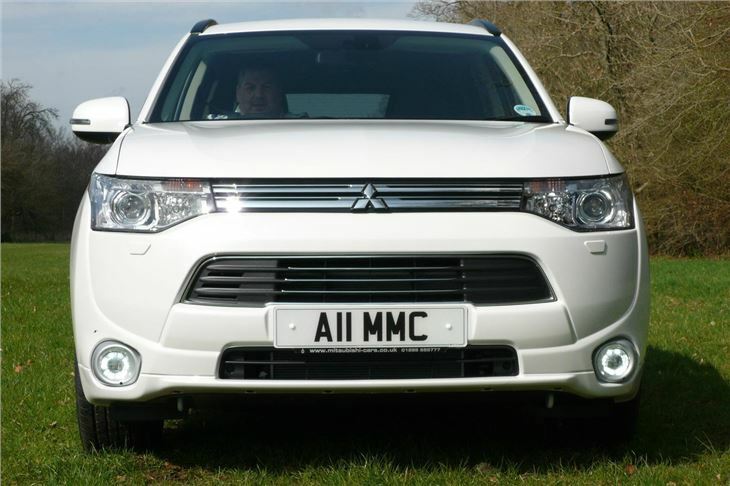 Mitsubishi calculates that, over the next 3 years, a company driver on 40% tax will save £11,201 in tax from running an Outlander PHEV compared to a Honda CR-V 2.0 EX automatic, which is equivalent to a (pre-tax) pay rise of £10,000 a year. So far it looks like a win-win-win situation for company drivers and the companies they work for. But the fuel economy benefit (on top of the tax benefit) depends entirely on how you use and drive the car. 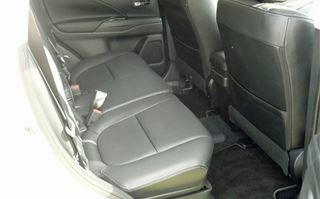 In a test run by Mitsubishi combining city and open road driving over 15 miles, the fossil fuel economy of seven freshly charged Outlander PHEVs varied between 94 and 1,412 miles per gallon, averaging 743mpg. On a subsequent 22-mile country drive with the batteries partly discharged and including 10 miles of motorway, the cars averaged 96mpg. And, after recharging, on a third run of 14 miles, that involved running in four-wheel-drive on rough tracks, the cars averaged 527mpg. Anyone driving 20 miles each way to and from work, with a recharging point at work, should use no fuel at all. Or a suburban mum using the car for shopping and taking the kids to school could run entirely on the batteries. But a company driver travelling 300 miles a day with no means of recharging the car from the mains might manage 100mpg, if he kept his speed down and regenerated while descending hills, but could get down to an average 40mpg or so. 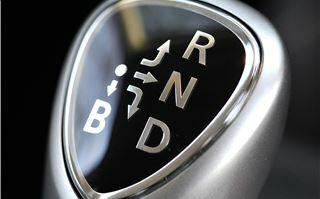 ‘Paddleshifters’ either side of the steering wheel allow the driver to select 5 levels of regenerative braking while lifting off into roundabouts or descending hills. Pure ’EV’ mode is selectable and runs to a point where the charge in the battery is depleted. 4WD mode engages the electric motors, driving both the front and rear wheels and is effective across fields and tracks. In fact, ride quality on rough tracks and through potholes was more impressive on the 225/55 R18 Toyo R37 tyres than on suburban roads where the tyres felt a bit hard. Though the considerable weight of the batteries is concentrated below the floor handling is affected by the sheer weight of 1,810kg. It’s okay for an SUV. Just don’t pretend it’s a sports car. And, of course, if you boot the accelerator, you will get the normal CVT feeling of the car gathering pace more slowly than the engine. 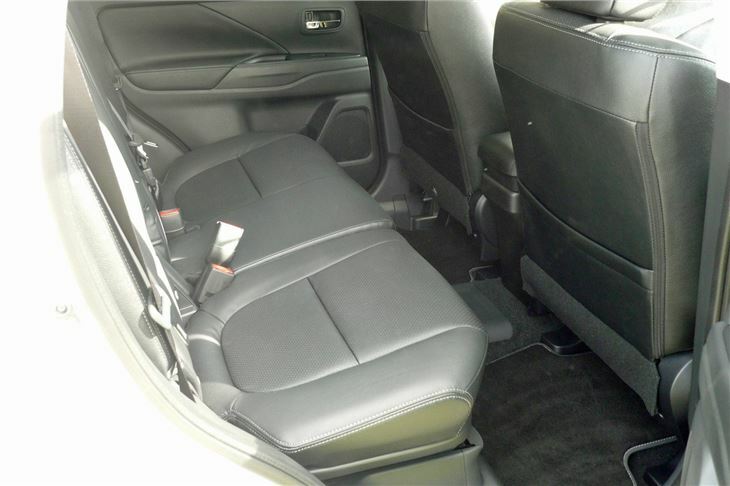 There is bags of room for passengers in the rear seats, and lots of room for bags in the 463 litre load area. (No possibility of a 7-seat version because of the rear electric motor. Driving position is comfortable. 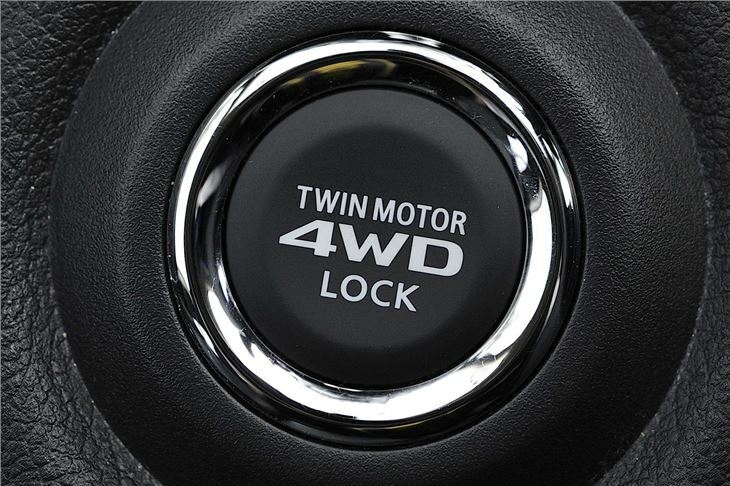 The gear selector system is the same as an Auris HSD or a Prius. 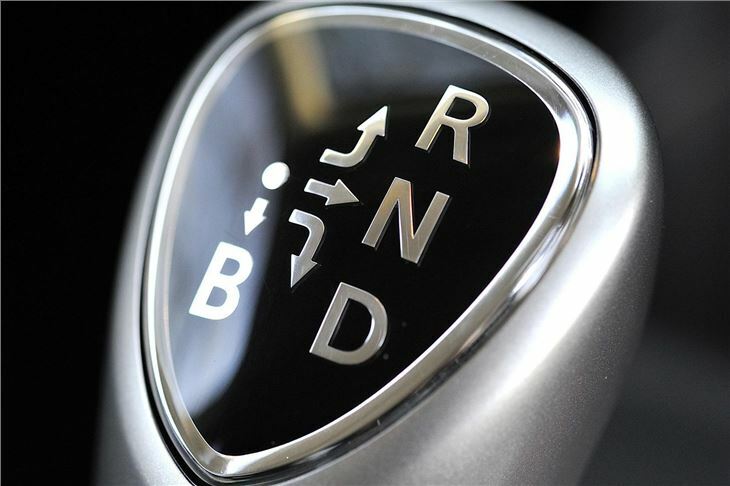 There’s a conventional ‘hand’ brake. It has sockets for the two different types of electrical plugs. Surprisingly, it will tow a caravan up to 1,500kg MTPLN. 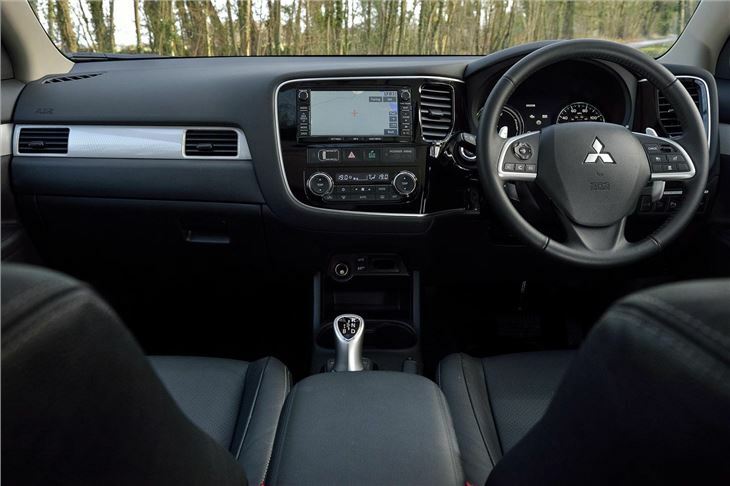 Thinking rationally, for most company car ‘perk’ drivers who either leave the car at home for the other half to use, or who drive 25 miles or less to work, the Mitsubishi Outlander PHEV is the only sensible SUV to have. The problem is that people are not necessarily sensible.